— Why Do I Suffer From Bunions? Have you ever looked down at your feet and noticed a bump present at your big toe joint? 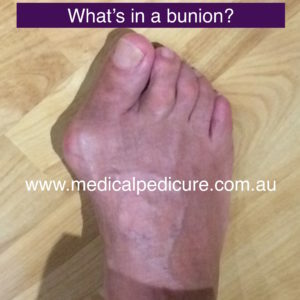 You may have a bunion! The term bunion will often get used but do we really know what it means? 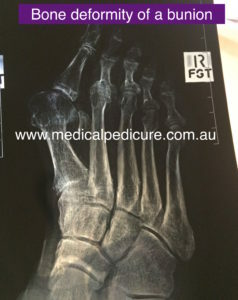 A bunion, also known as Hallux Valgus Deformity (HAV) is a progressive disease that commonly affects both male and females, though there is a greater proportion of females. The bunion will occur at the base of the big toe joint. Typically, it has been found that the big toe moves slowly towards the second toe. As a result of the changes of the big toe’s position, a bump may develop on the side of the base of the big toe. Quite often the skin becomes thicker and you may find the surrounding tissues become inflamed, swollen and painful. Inappropriate footwear which are tight, restrictive and narrow for your foot. Some types of shoes that can be considered inappropriate are high heeled, pointy shoes which cram your toes together and thongs that provide no support for your feet. It is important to have your bunions checked to ensure that you are provided with the appropriate treatment options to delay progression, reduce pain and prevent other foot related conditions occurring such as hammertoes, metatarsalgia and bursitis.